Personal motivation to achieve the goal: How to Get Rid of Excess Weight and Bad Habits, Start to Play Sports, Create Stress Resistance and Learn to Save it All. This book is suitable for both men and women. In the book you will find psychological and practical advice on how to change your lifestyle for the better, namely: how to get rid of excess weight and bad habits, start to play sports, create stress resistance and learn to save it all. In addition, here you will find a course of practical exercises in order to create and maintain all of this. Just believe in yourself. Do you want to achieve this? Just read this book and do it as written here! Interesting? Then do not waste time. In the turmoil of everyday life, we are often busy with the things that we really do not want to do, but simply because we consider it our duty and obligation. And often this happens only because we think that we cannot do different things in our life and that we cannot be different. Stop, sit down and think: Are you satisfied with everything in this life? Did you try to change anything? No? And why? But in fact, you do not do anything for this. Why? Because you do not want to, and because do not believe in yourself. Everything is very simple. All the problems are in our head. It is important to understand this and realize this. 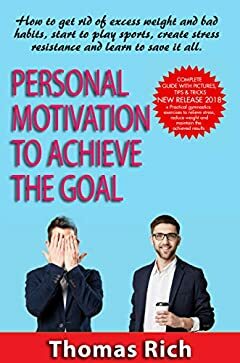 In this book, I will tell you how to change yourself for the better: how to start a normal lifestyle, get rid of excess weight, bad habits, play sports, cope with stress, create stress resistance and learn how to keep all of this. I will tell this in my own words, from a practical point of view. Minimum of theory, more practice.